Large range of chickens in stock. Bespoke coops and wooden buildings. Plastic and wooden easily cleaned houses with opening roof, removable droppings tray and other practical features, for up to 6 layers, also a range of roll away nests, feeders and drinkers, all at very reasonable prices. Chickens, ducks and geese. POL hybrids and pure breeds. Poultry supplies and auction. Duck breeder specialising in Khaki Campbell and Cherry Valley varieties. Small-scale or commercial supply. Good layers and excellent pet breeds. Day old to point of lay. Hand knitted woollen jackets designed especially with ex-battery hens in mind. £3.50 each, variety of colours available. 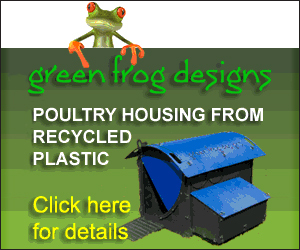 One stop shop for all your poultry and poultry supplies. Hens, hatching eggs and houses.